I LOVE photography. Its my job but it is also my passion. I also have a degree in education and I love teaching as well. 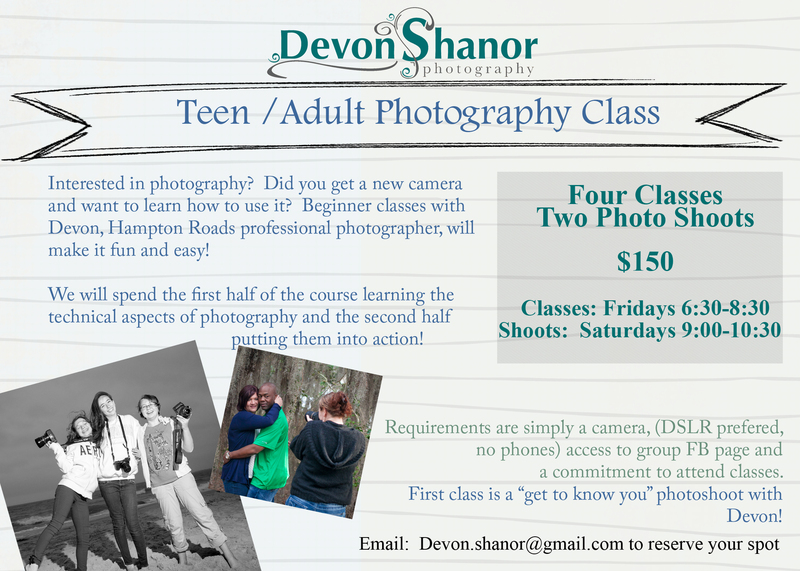 If you have been wanting to learn more about photography and want to do it in a small, intimate, fun setting then I have the class for you! Not only will you LEARN but I promise lots of fun too! We’ll have at least two photo shoots, one where I photograph and another where YOU get to put into action what you have learned! Information is below and if you wish to sign up just go here! I have the pleasure teaching a teen photography class and this past weekend we had our first field trip! We went to Great Neck Park to simply “find the light” and experiment with composition. We had a few of our students unable to make it (these Virginia Beach School on Saturday make-up days have thrown all of our weekends off!) but those who came out had a great time! I love working with teens and Eva, Dnzel and Zoe are awesome young people who are showing lots of talent! Check out some of our fun!